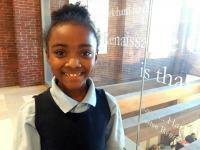 St. Jude’s Children’s Research Hospital received an unexpected gift this week from Boston Renaissance Charter Public School third grader Tamil Burnett, who used her voice to benefit a cause that was important to her. The Dorchester girl e-mailed the Head of School, organized a petition, presented her case, and gathered over 200 signatures to launch “Freestyle Friday” at Renaissance, a uniform-free day for students who donated $1 to assist St. Jude’s. Burnett presented a check for nearly $3,000 to St. Jude’s Cancer Hospital in Newton on Monday. “She had her own clipboard, talked to students on her own and explained the rationale and initiative,” said Alexandra Buckmire, the Head of School at Renaissance.